MIT engineers have built a radio-frequency replica of the human inner ear that could be used to create a an ultra-broadband 'universal' or 'cognitive' radio chip capable of picking up mobile phone, GPS, radio, internet and Bluetooth signals. The chip is faster than any human-designed radio-frequency spectrum analyser and also operates at much lower power. "The more I started to look at the ear," said Rahul Sarpeshkar, associate professor of electrical engineering at MIT, "The more I realized it's like a super radio with 3,500 parallel channels." The human cochlea can perceive a 100-fold range of frequencies (from 100 to 10,000 Hz). 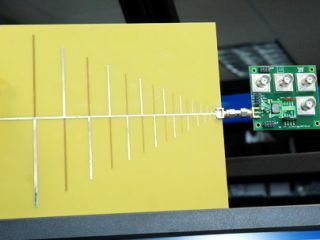 Sarpeshkar's RF cochlea can perceive signals at million-fold higher frequencies, which includes radio signals for most commercial wireless applications. The RF cochlea, embedded on a silicon chip measuring 1.5mm by 3mm, detects the composition of any electromagnetic waves within its perception range. It's faster than other RF spectrum analysers and consumes about 100 times less power than that required for direct digitisation of the entire bandwidth. This isn't the first time Sarpeshkar has drawn on biology for inspiration in designing electronic devices. Sarpeshkar's MIT group previously developed an analogue speech-synthesis chip inspired by the human vocal tract and an analysis-by-synthesis technique based on the vocal tract. The chip's potential for speech recognition and voice identification have applications in portable devices and security applications. He is also working on projects inspired by signal processing in cells, and has worked on hybrid analogue-digital signal processors inspired by neurons in the human brain. "Humans have a long way to go before their architectures will successfully compete with those in nature, especially in situations where ultra-energy-efficient or ultra-low-power operation are paramount," Sarpeshkar said. "We can mine the intellectual resources of nature to create devices useful to humans, just as we have mined her physical resources in the past."